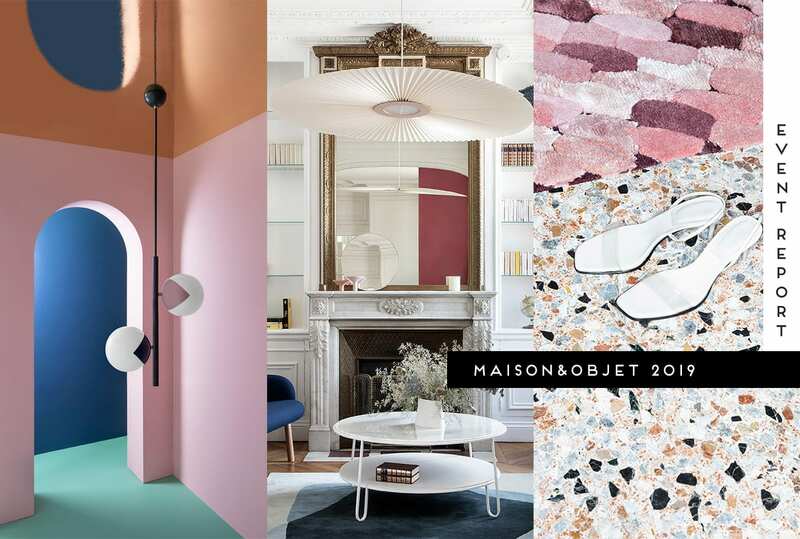 The 2019 concept for Parisian design show Maison & Objet played close to home, highlighting the global influence of the French je ne sais quoi with Excuse My French! Vincent Grégoire of NellyRodi credits a renewed curiosity for the French with figures such as first lady Brigitte Macron, designer Olivier Rousteing, and the victorious World Cup soccer team. 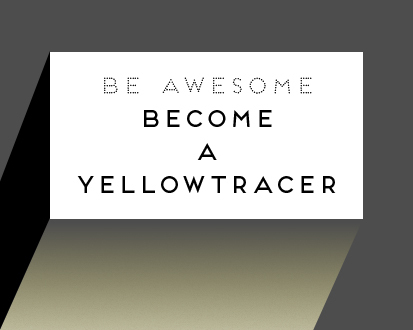 “In a world where things are becoming standardised, people are looking for something distinctive. We have a certain je ne sais quoi, an effortless chic, something you don’t find anywhere else,” he says. 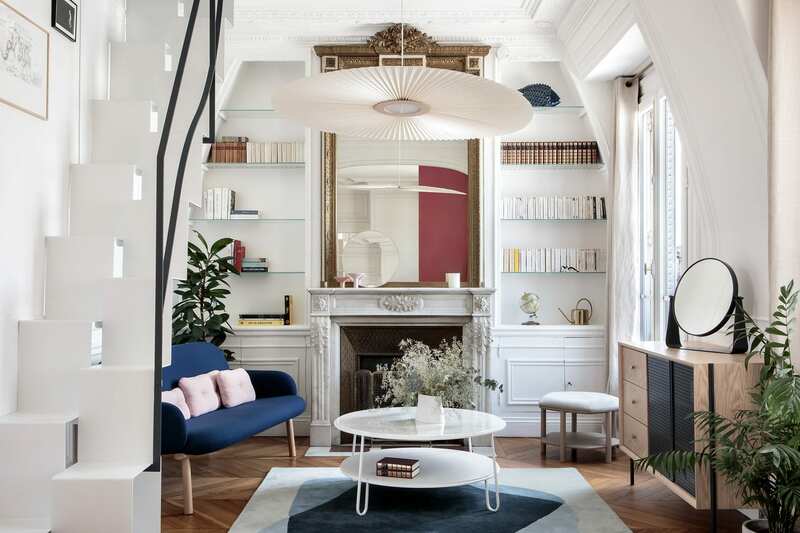 The décor is based on the Hall of Mirrors in Versailles, with dissonance via a small truck parked in the middle of the space, and an ultra-contemporary light planted amongst traditional chandeliers. “French style is all about playing with opposites and exploiting the art of paradox,” says Grégoire. The third edition of the Rising Talent Awards looked to China, with a jury of experts in the field of contemporary Chinese design invited to select six of the country’s best emerging talents. 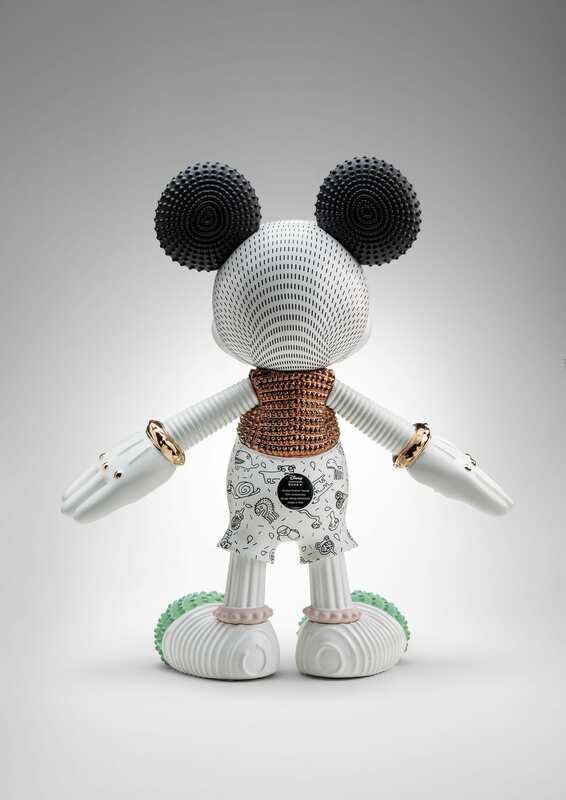 Liu Xu, Xing Tong-He, Qu Guangci, Tom Dixon, Luca Nichetto, Lyndon Neri and Rossana Hu nominated Frank Chou, Chen Furong, Mario Tsai, Hongjie Yang, Ximi Li, and Bentu as China’s brightest young designers. 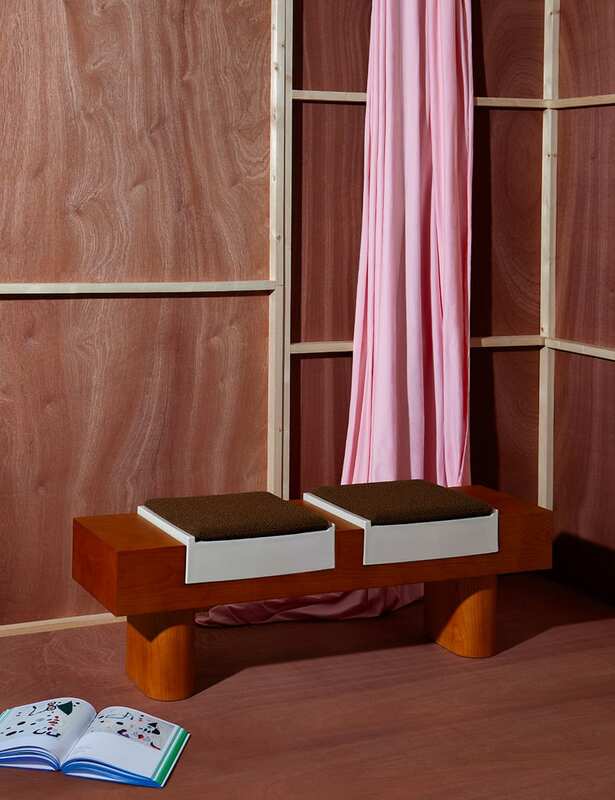 37-year-old German designer Sebastian Herkner was announced as Designer of the Year, with a dedicated space unveiling his latest creations. 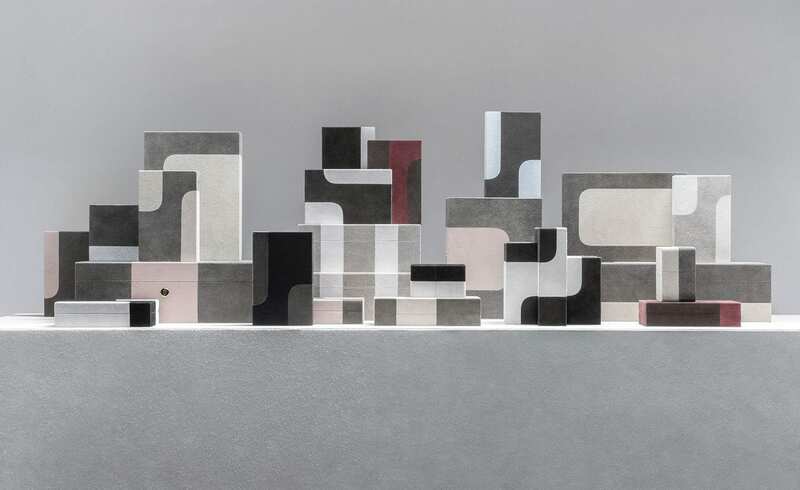 Since training at the Offenbach University of Art and Design and setting up his first studio in 2006, Herkner has been awarded no less than thirty awards acknowledging his innovative, yet traditional work. 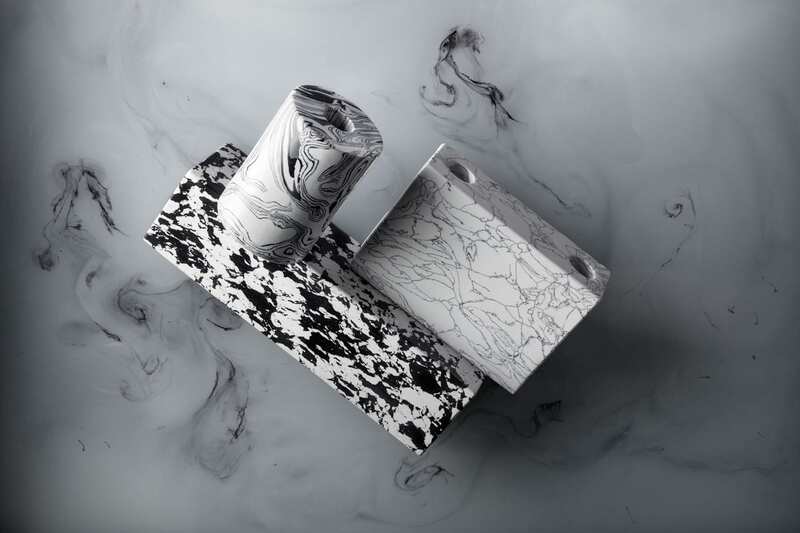 Herkner draws global inspiration for creating designs that combine his unconditional love for traditional craftsmanship, with a focus on new technology and unbridled creativity. Without further ado, let’s get stuck into this year’s highlights. Get ready to scroll, people! Sorry, not sorry. 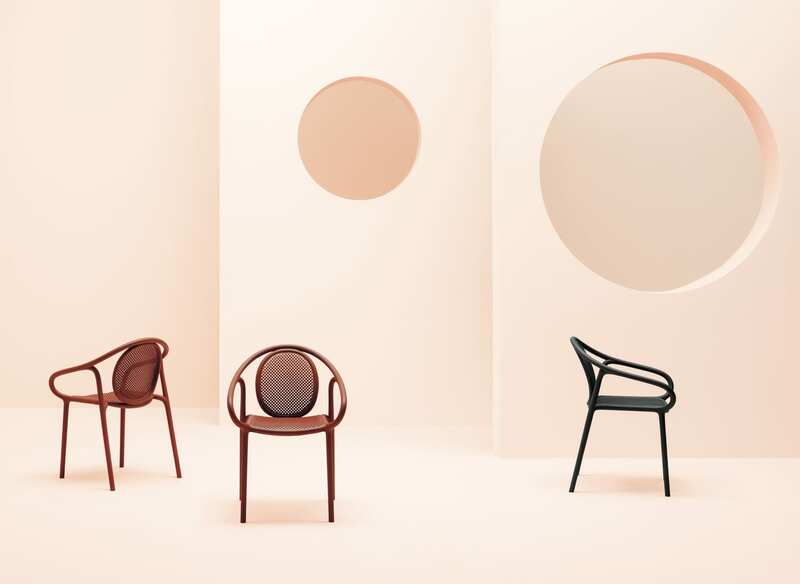 Maison & Objet 2018: Best In Show. Maison & Objet 2017: Best In Show. Maison&Objet 2016: Best In Show. 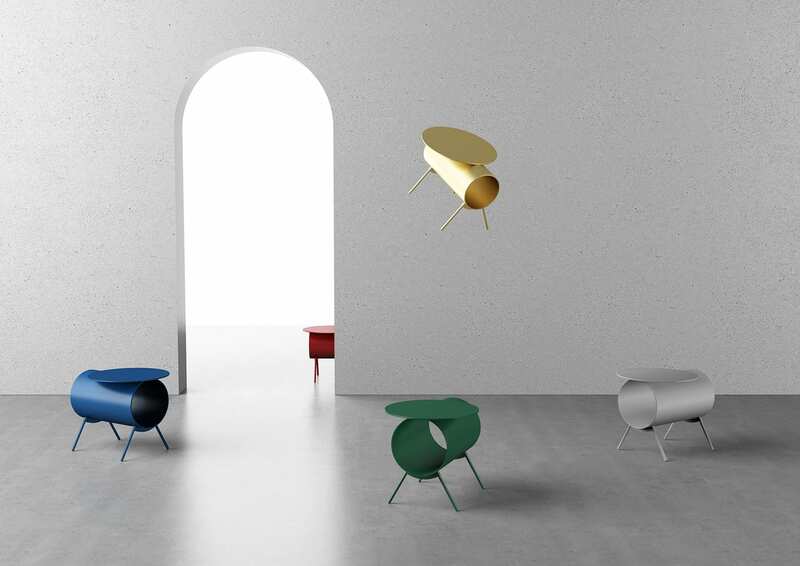 Maison&Objet 2015: Best In Show. By 3 by Ximi Li for Urbancraft. Pig Table by Mario Tsai. 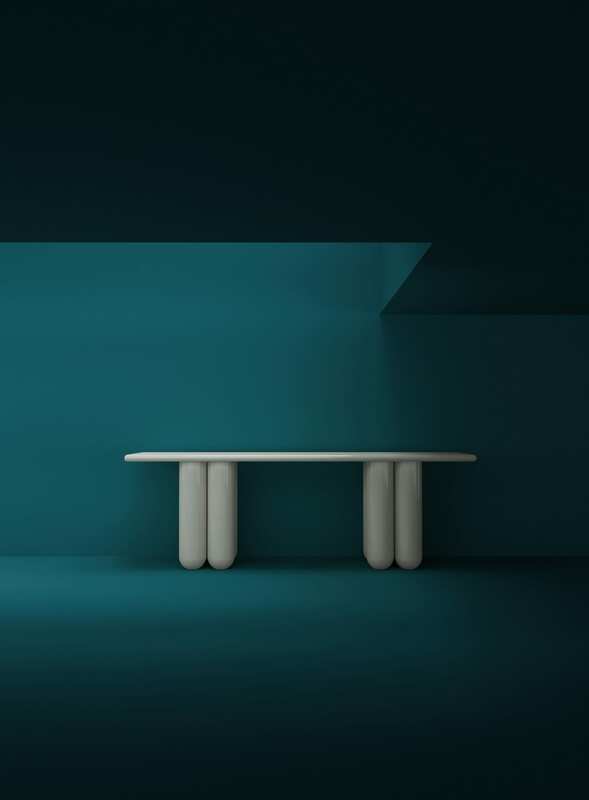 Stack table by Frank Chou. 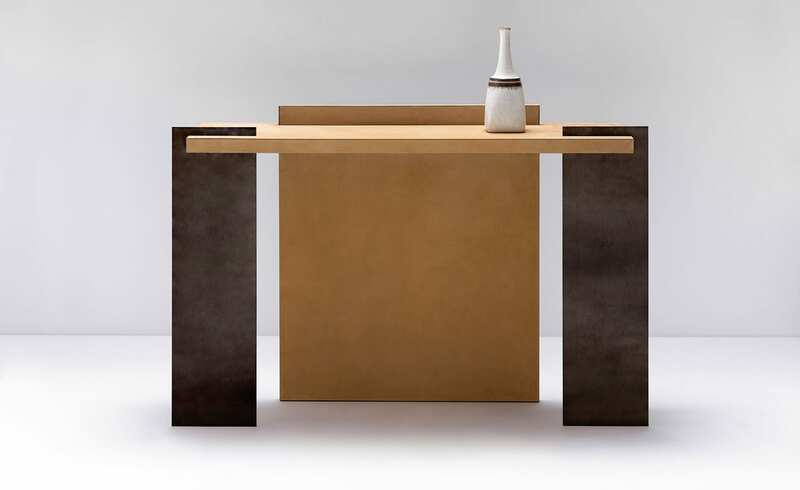 Bold Bold Console Table Table by Frank Chou. 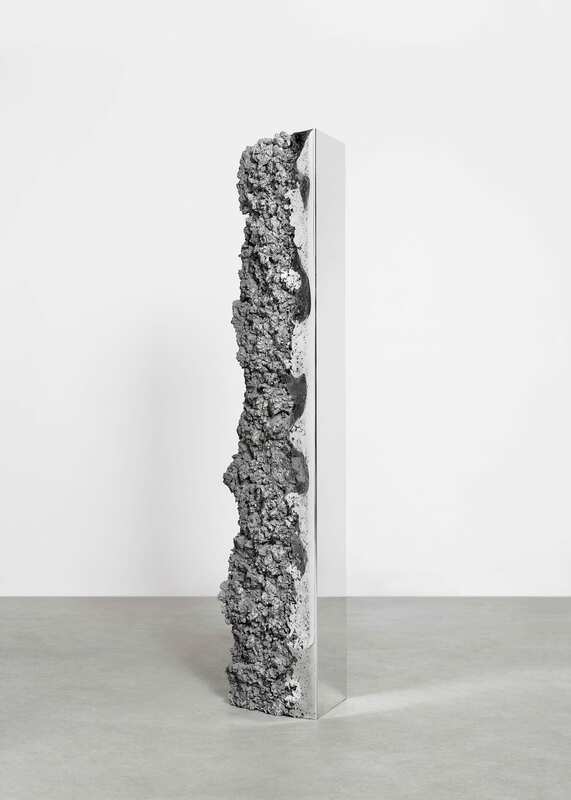 Synthesis Monolith Mirror by Hongjie Yang. 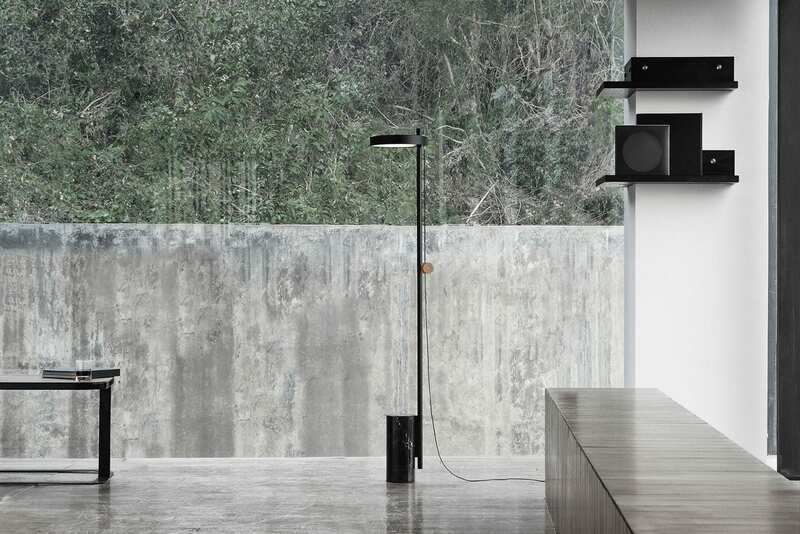 T floor lamp by Chen Furong. Rising talents from China // In collaboration with DesignChain, the six Rising Talent nominees were invited to exhibit their creations at the fair, with the exhibition also displayed at Galeries Lafayette Homme until February 19. 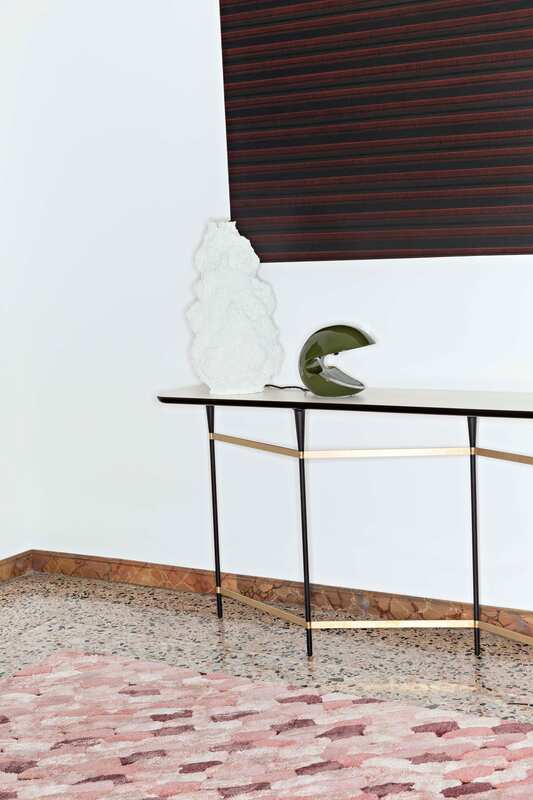 Standouts include Frank Chou’s geometrical Stack Table, combining welding technology with an art-deco brass mottled finish. 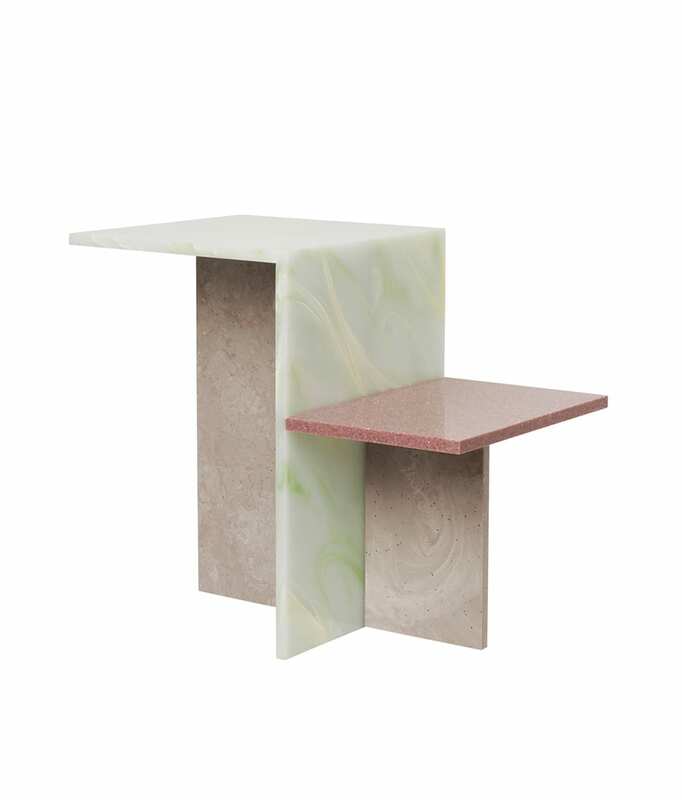 Ximi Li’s interlocking terrazzo, glass, and marble By 3 cabinet integrates influences from East and West, while Mario Tsai pays homage to the year of the pig with his aluminium tube-inspired Pig side table. 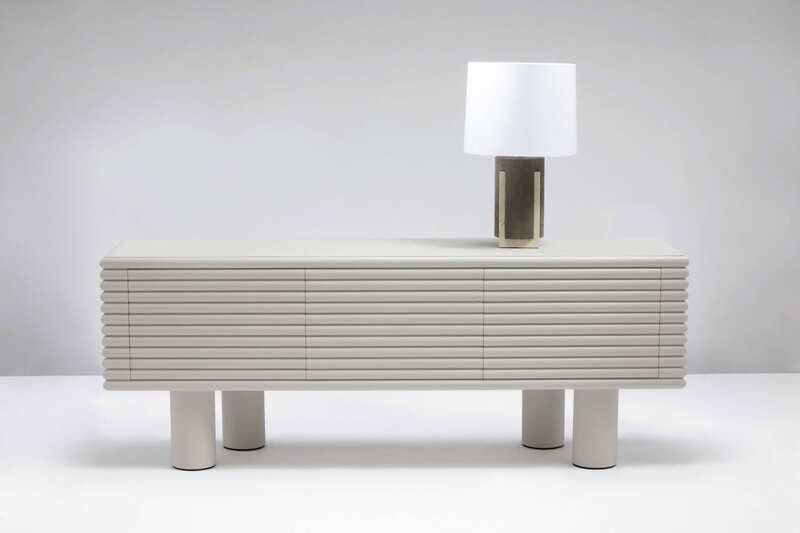 Scala Collection by Stephane Parmentier. 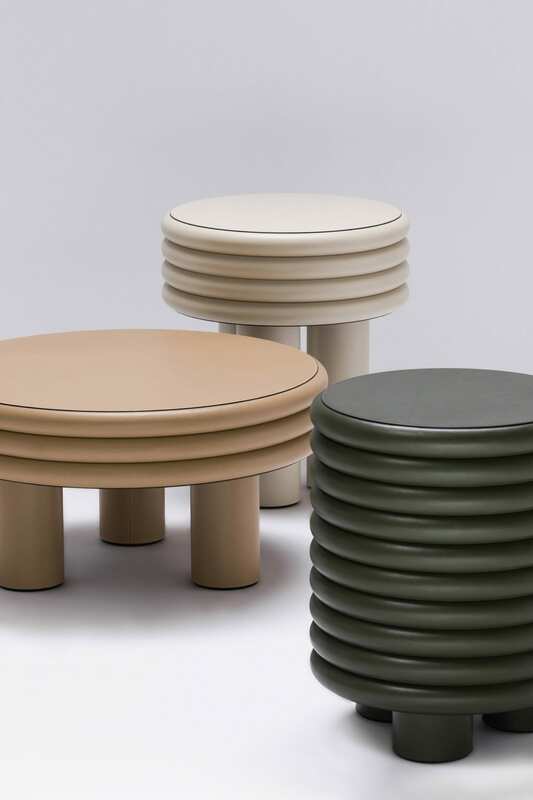 Stephane Parmentier for Giobagnara // Past favourites from designer Stephane Parmentier for Italian leather house Giobagnara were on display, including his Scala furniture collection, made from stacked circular forms wrapped in suede and nappa. 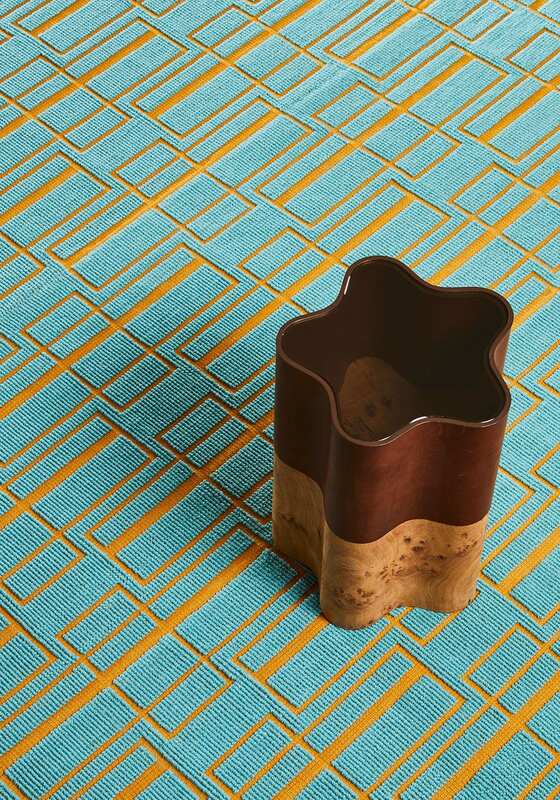 Rendered in suede with shearling inlays, the Flow set of abstract, decorative containers can be mixed and matched. 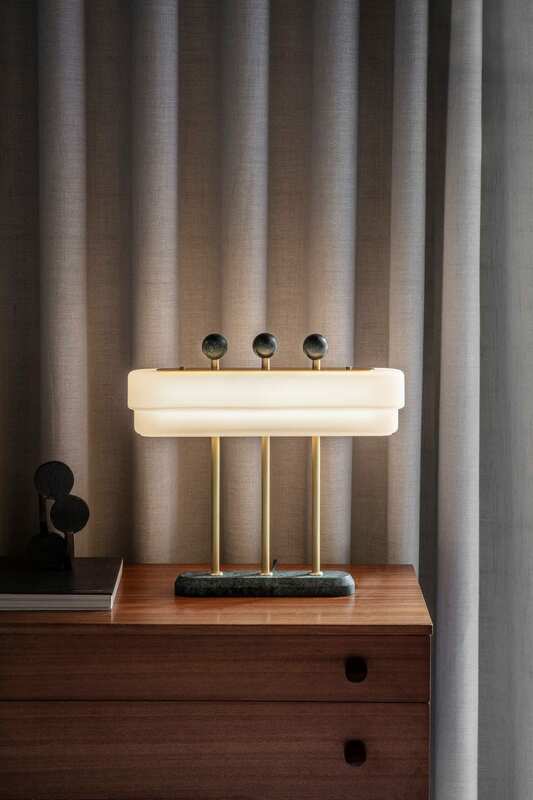 Spate collection by Bert Frank // An opulent nod to Art Deco styling, the Spate table lamp and wall light are comprised of a soft opal stepped glass shade, satin brass metalwork, and marble highlights. All the good things. 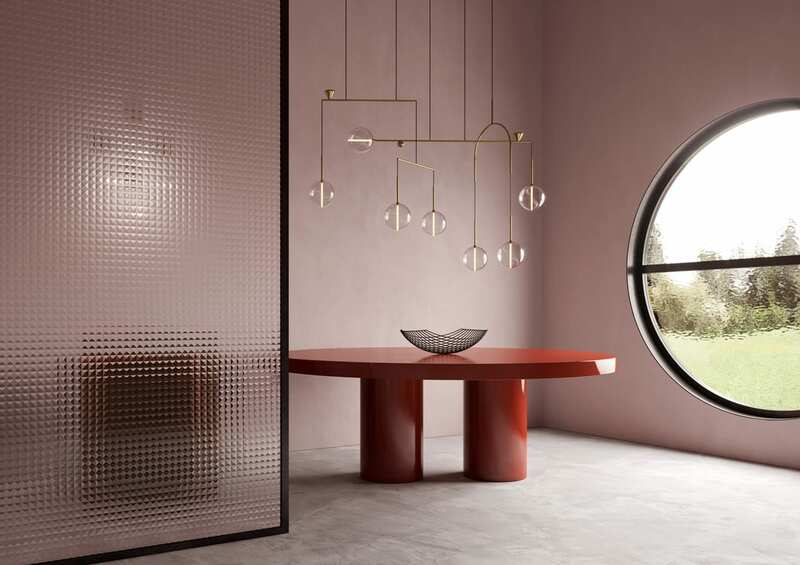 Dewdrops light by Giopato & Coombes // Christiana Giopato and Christopher Coombes were inspired by the simplicity of moonlit dewdrops for their brass ‘mobile’ chandelier. Two upward spotlights hidden within brass cones enhance the soft light emitted by hand-blown glass bulbs. 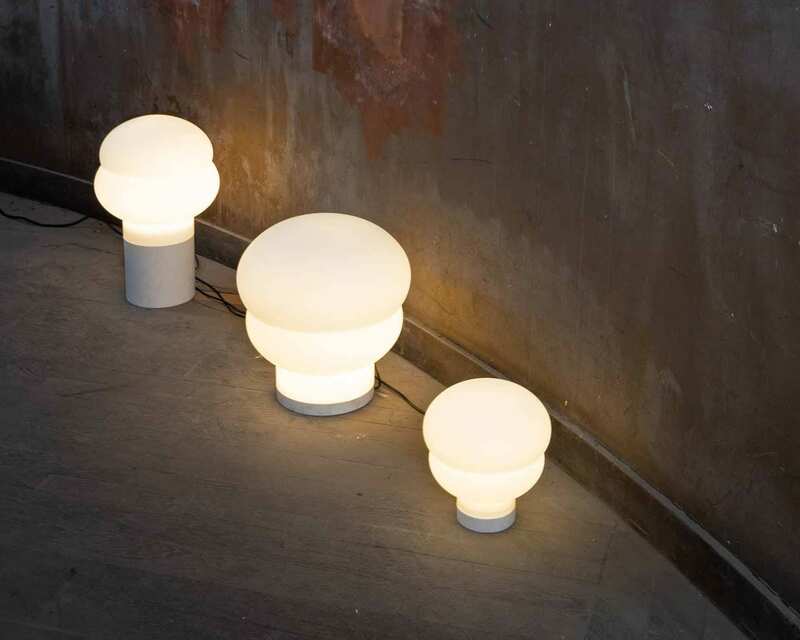 Kumo floor & table lamps. 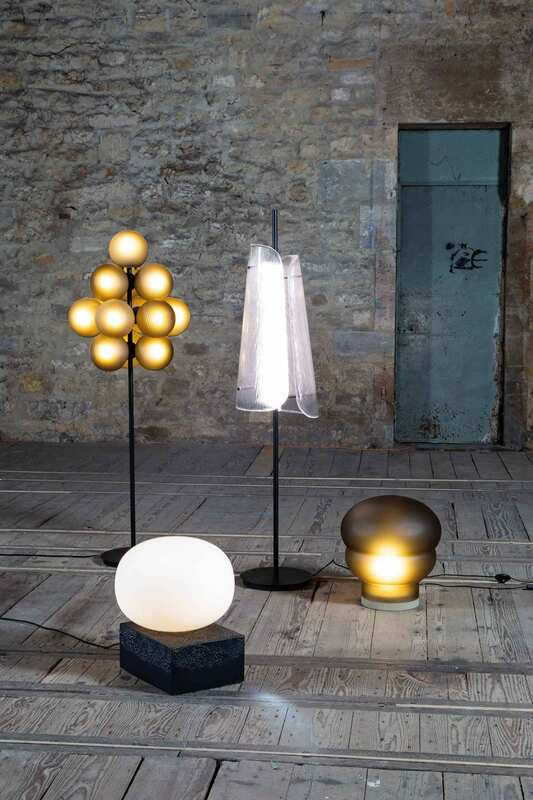 New lighting collection from Pulpo // No-made design debuted KUMO floor and table lamps for Pulpo, referencing the shape of traditional Japanese paper lanterns by fusing two spheres into one hand-blown glass silhouette. 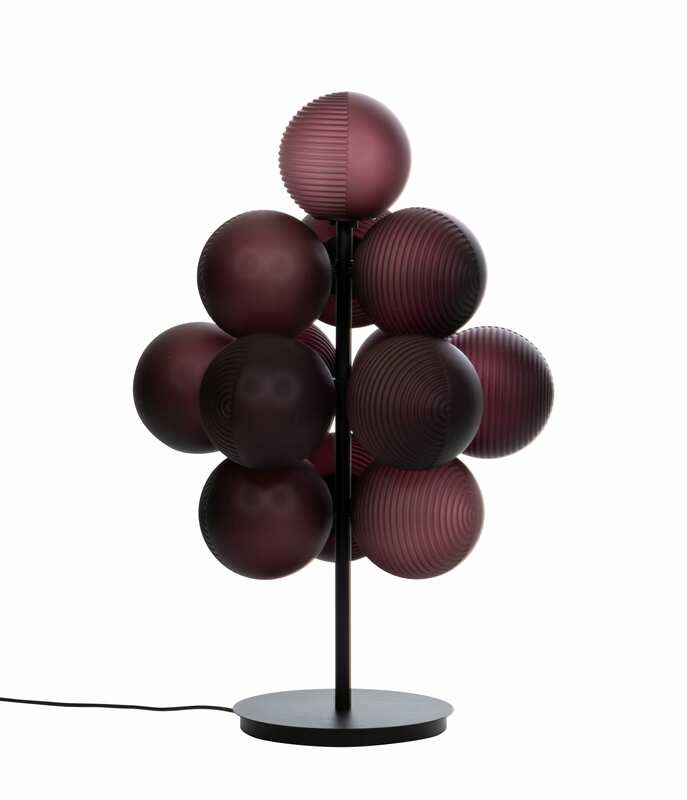 Sebastian Herkner’s Stellar Grape lamp is impossible not to love – comprised of frosted acetate semi-spheres that quite literally resemble a bunch of red grapes. 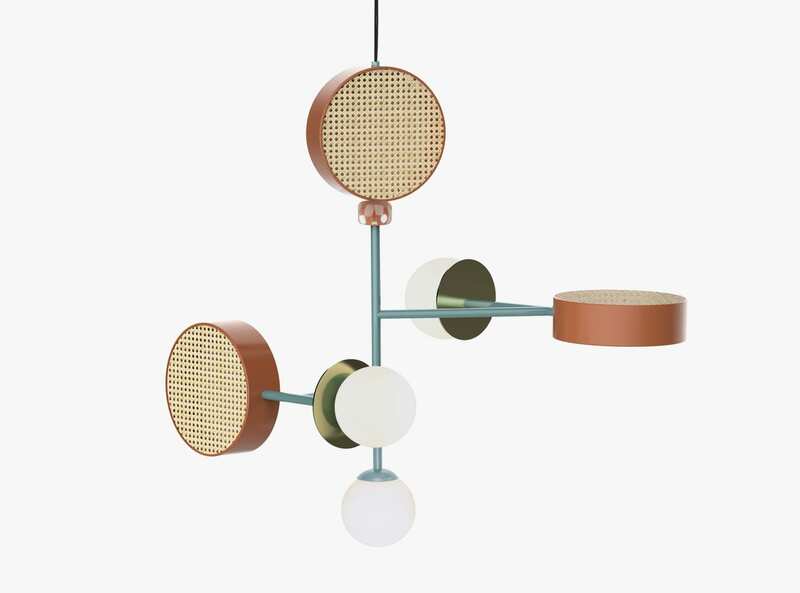 Monaco collection from Utu // Brass details enhance retro rattan mesh and opal glass spheres in this customizable light. 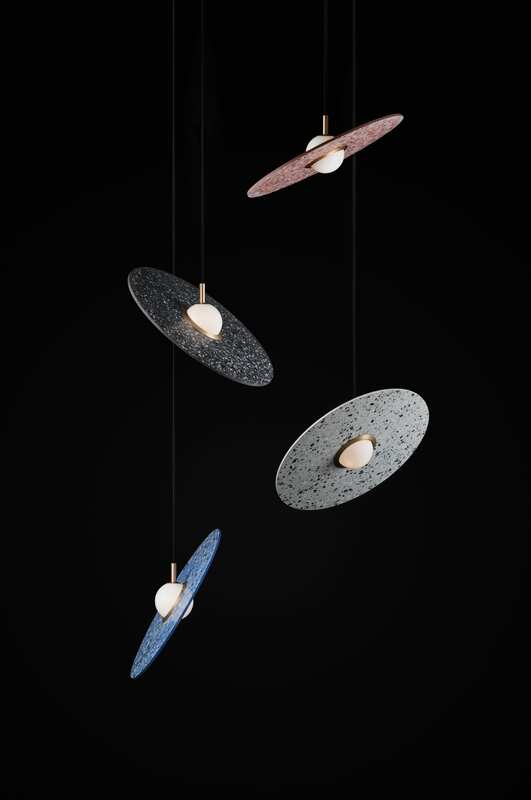 The Monaco suspension system is inspired by mobile art sculptures, with components fixed to a moveable metal arm – a unique silhouette that is ornamental as well as functional. 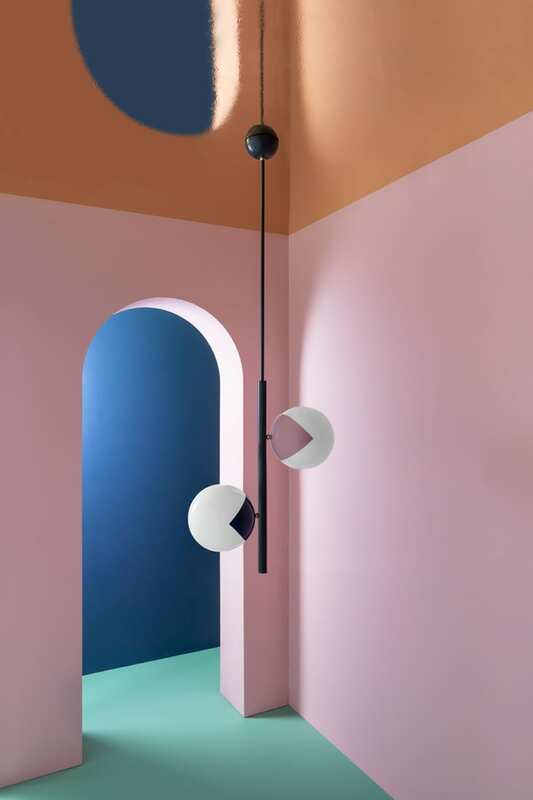 Carmen pendant lamp by PaulinePlusLuis for Hartô // Design studio PaulinePlusLuis were inspired by a dancer’s skirt for this captivating pendant light. 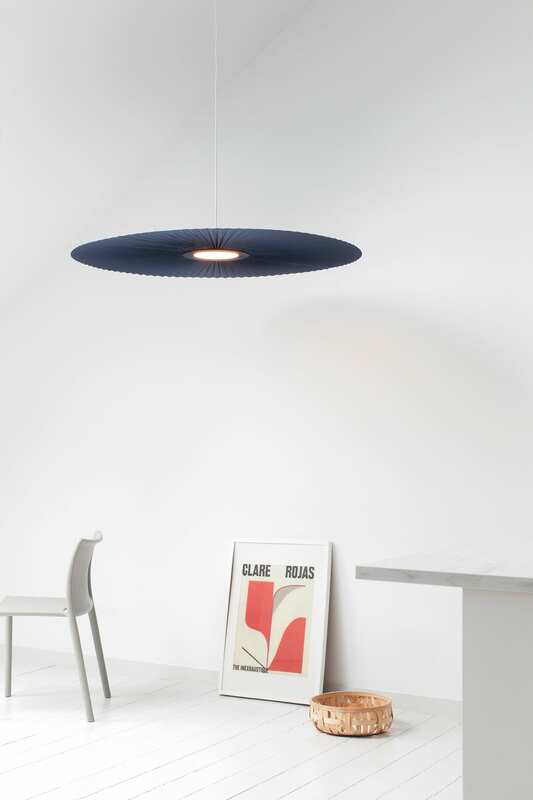 The repetitive pleats fan out to form a luminous disc, and were designed according to textile experimentation. Available in ballet slipper pink or navy blue. 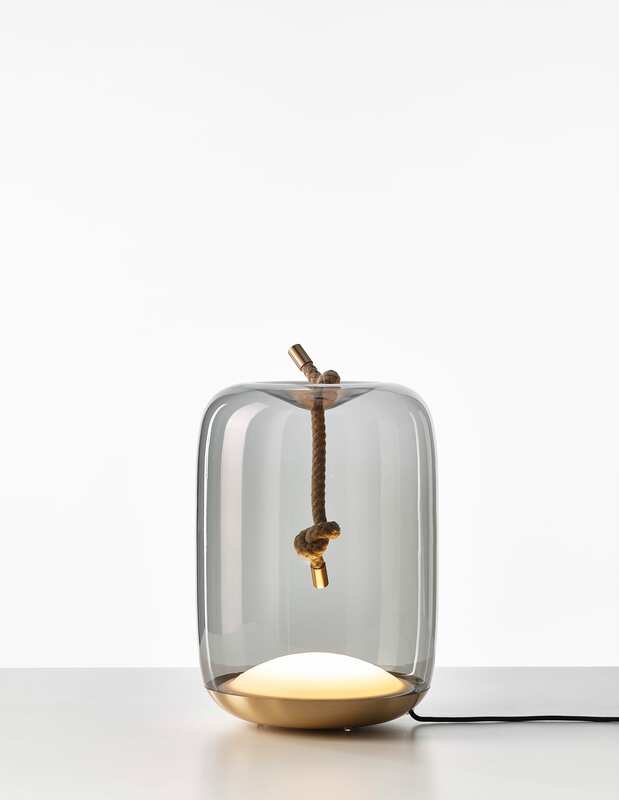 Knot table lamp by Chiaramonte Marin for Brokis // Italian design duo Chiaramonte contrast rough natural fibre rope with smoky grey hand blown glass, illuminated by an LED base. 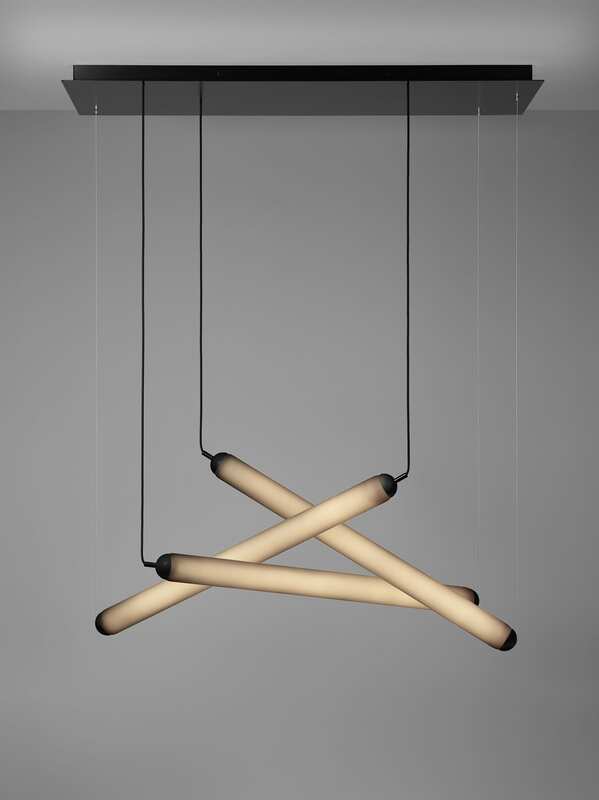 Puro Eclectic light by Lucie Koldova for Brokis // Making its debut, this dynamic lighting composition comprises suspended lights in the form of hand-blown glass Puro tubes. 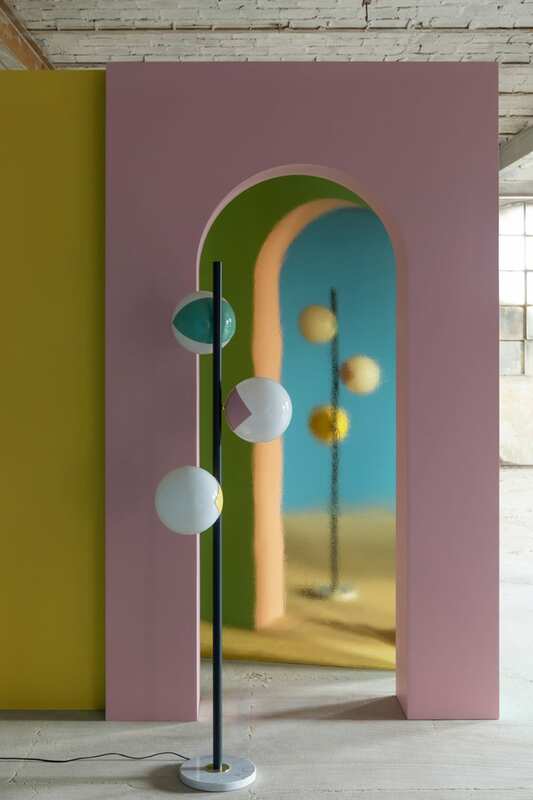 Pop-Up lights by Magic Circus Editions // Magic Circus Editions founder Marie-Lise Féry applies her trademark “retro-for-tomorrow” approach to the Pop-Up collection, inspired by the outdated hedonism of the 1970s. 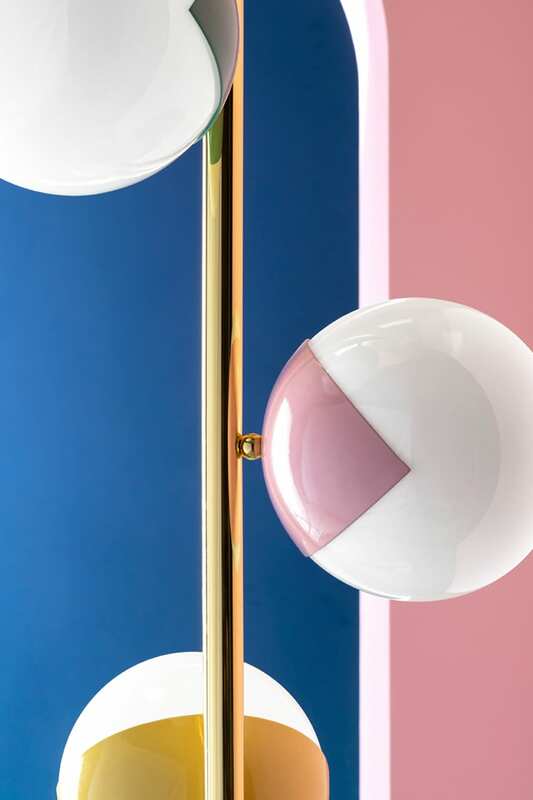 Colourful lacquered brass globes reminiscent of cartoon eyeballs balance atop golden stems, with floor and table lamps standing on a Carrara marble base. 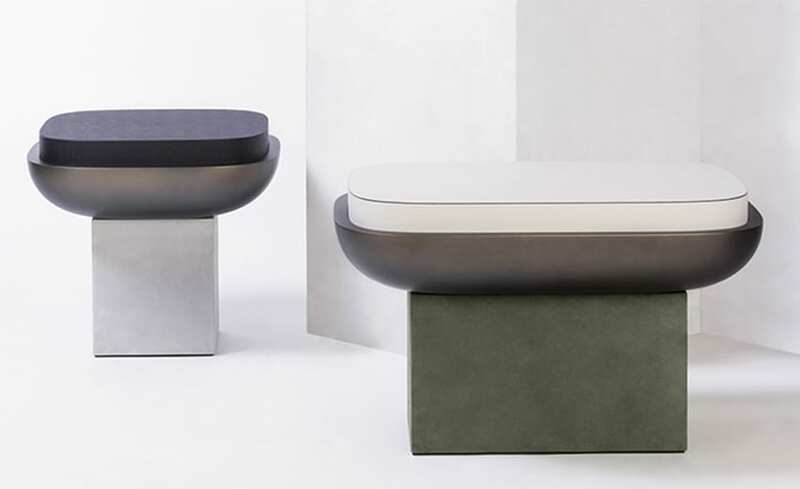 Féry’s vivacious design questions the changeable status of objects between function and aesthetic, with signature reverie. 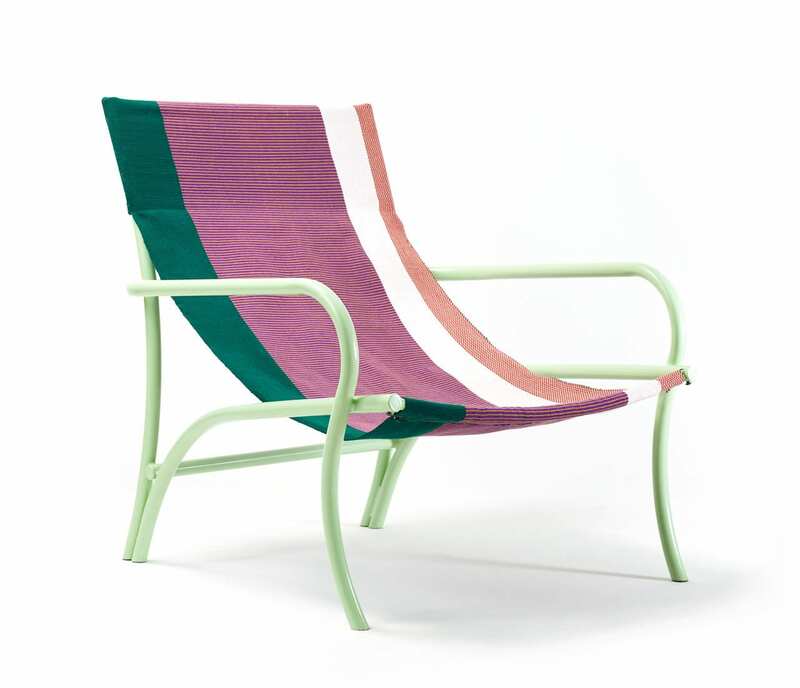 Maraca lounge by Sebastian Herkner for ames // The Maraca Lounge Chair is Designer of the Year Sebastian Herkner’s latest collaboration with ames, having launched the CARIBE collection last year. 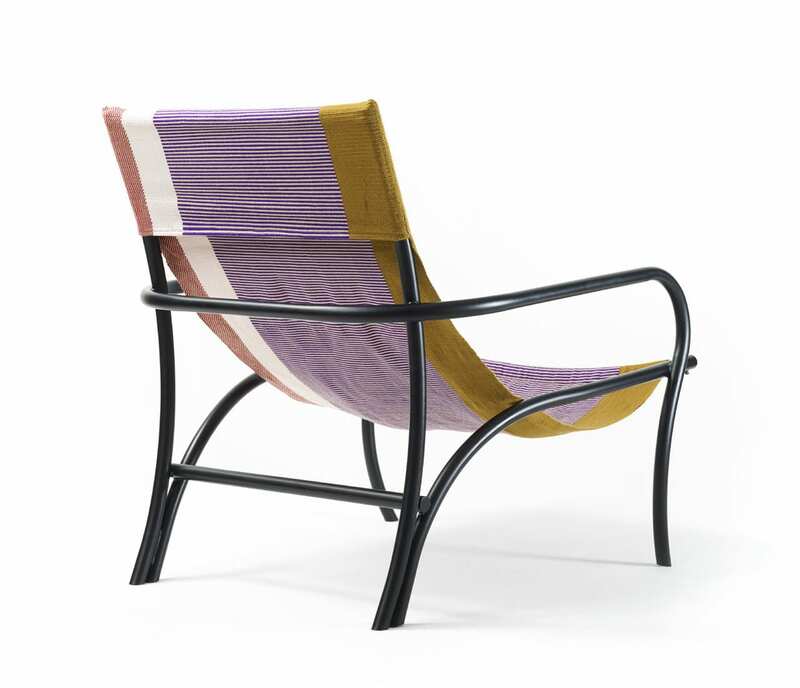 Inspired by traditional Colombian hammocks, the colourful chair features a metal base supporting a woven hammock, ready for some lucky person to relax in. Bench by Haos // This cherry wood veneer bench is versatile – it could work in an entranceway, by a dining table, or at the end of a bed. 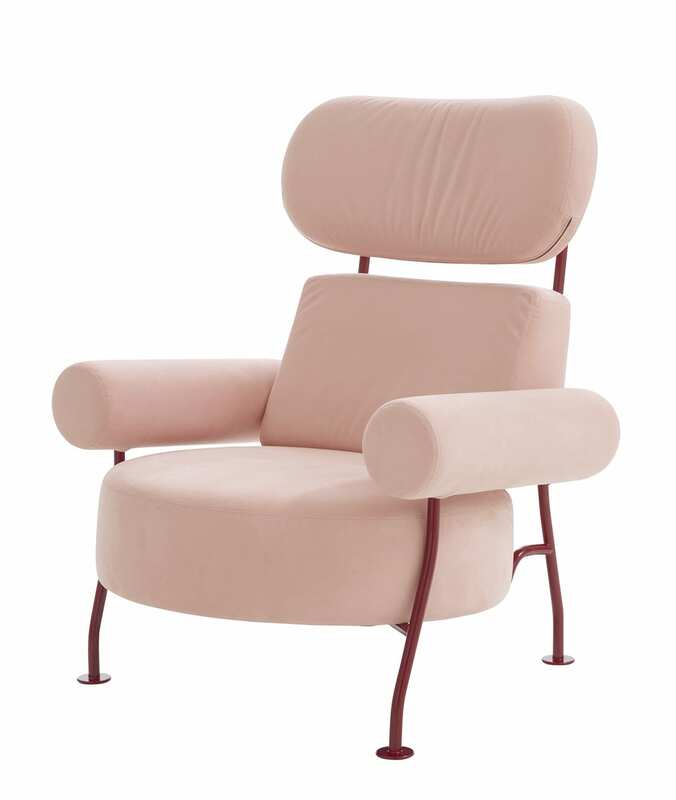 Available with or without cushions (you’d probably want to opt for with cushions, for comfort atop the ceramic white seats). 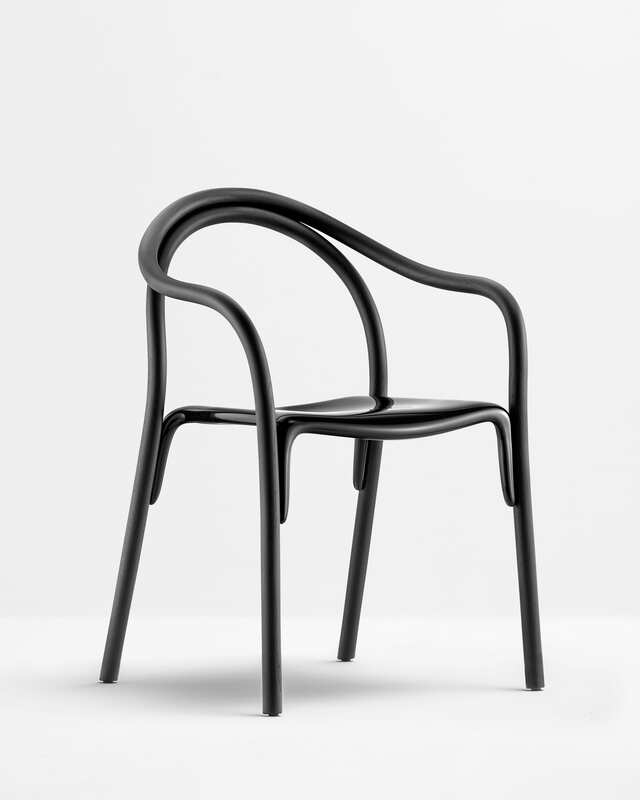 Astair chair by Pierre Charpin for Ligne Roset // Separate, rounded cushions are affixed to a slender, tubular steel frame for Pierre Charpin’s latest armchair design for French brand Ligne Roset. 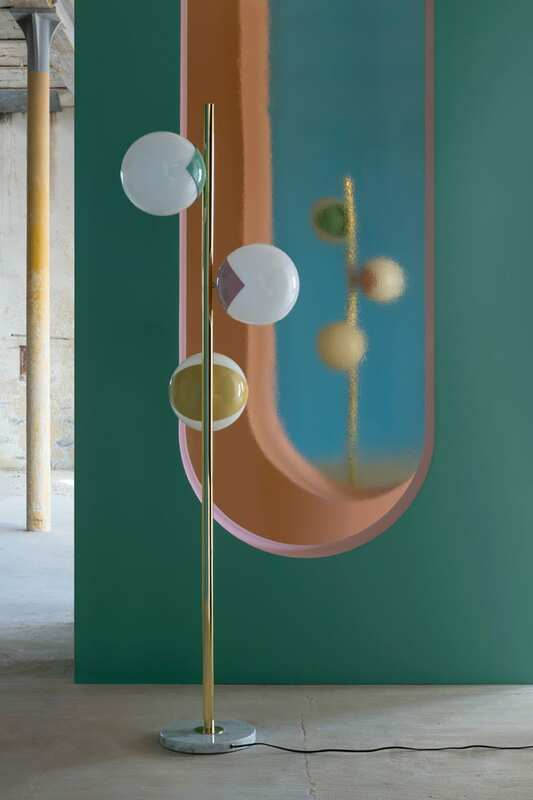 New designs from Pedrali // Inside Pedrali’s lightbulb-themed exhibition space, special attention was given to a new collaboration with Catalan designer Eugeni Quitllet. 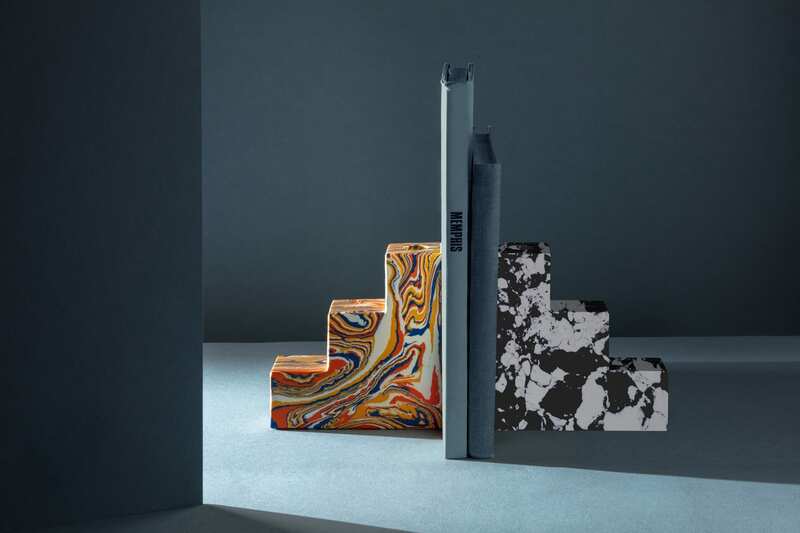 The Soul chair, recipient of a Special Mention in the 2019 German Design Awards, is meant to express uncontaminated creativity. 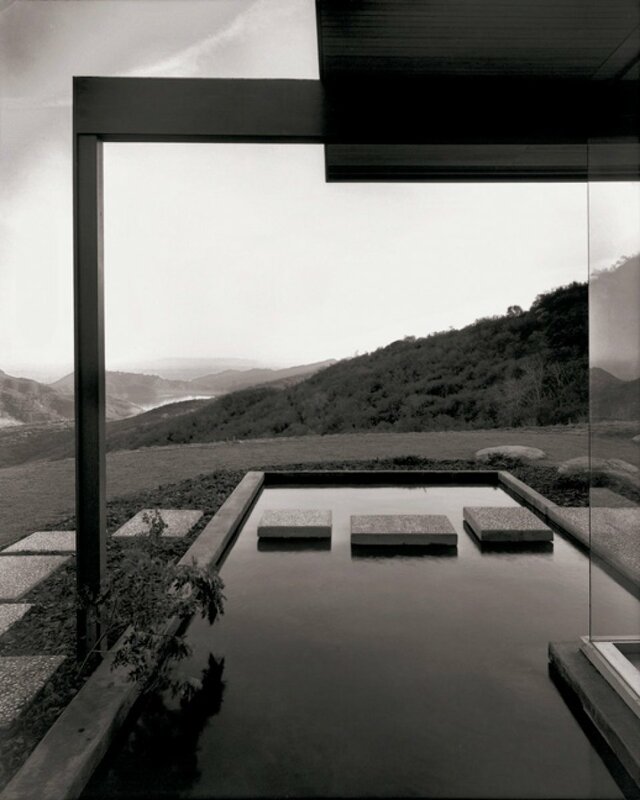 A polycarbonate seat appears suspended by the solid ash frame, a hybrid of natural and man-made materials. 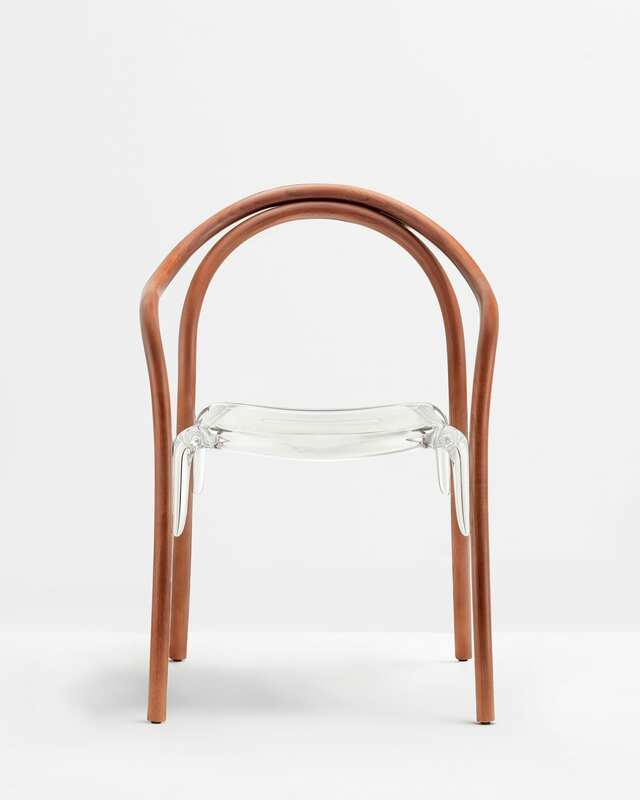 Remind’s organic silhouette evokes the sinuous curves of wooden chairs from the late 19th century. 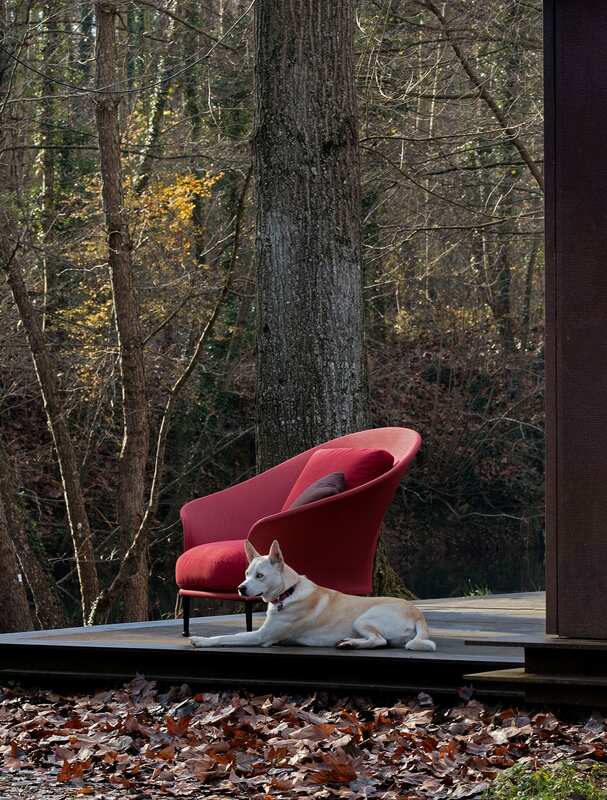 Quitllet’s innovative use of injection-moulded polypropylene makes the armchair functional and suitable for both indoor and outdoor spaces, bringing the design into the 21st century. 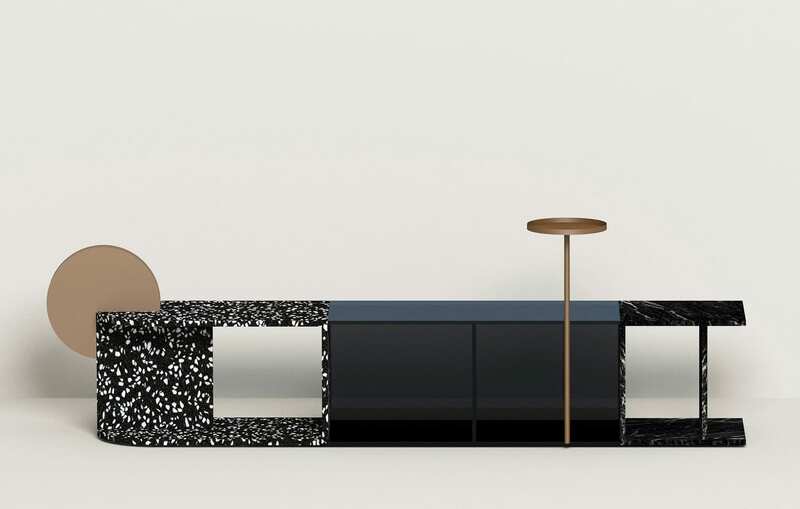 Liz collection by Ludovica Serafini and Roberto Palomba for Expormim // Inspired by the sensual form of none other than Elizabeth Taylor, “Liz is a Project inspired by the flair of the 50s. 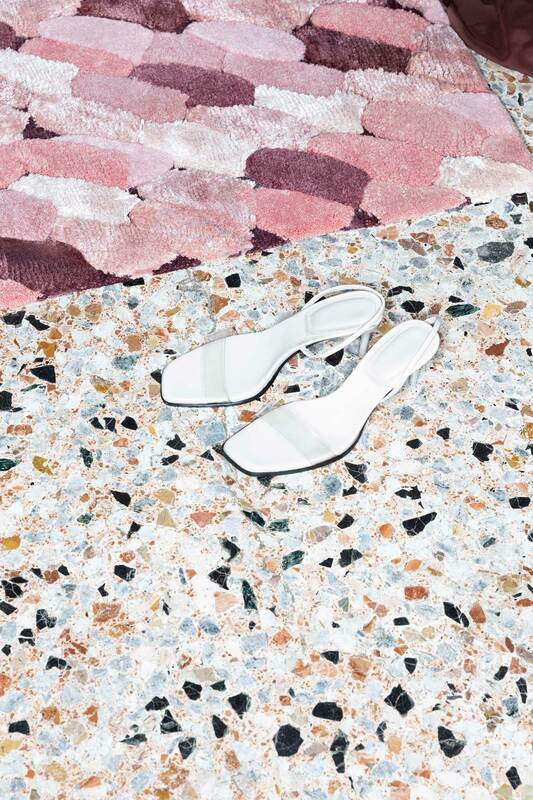 The elastic fabric stretching along the metallic tubular structure marks lines and transparencies, giving rise to a play of graphics and lightness that make you feel the soft embrace of Liz,” says Serafini and Palomba. 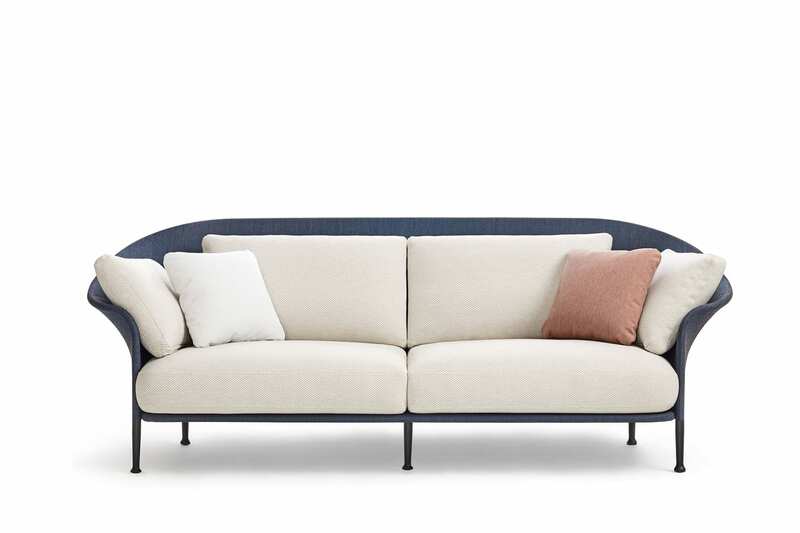 The collection, featuring an armchair, sofa, and XL sofa, is customizable with a wide variety of technical fabrics suitable for outdoor use, in colours including orange, poppy red, and deep sapphire. 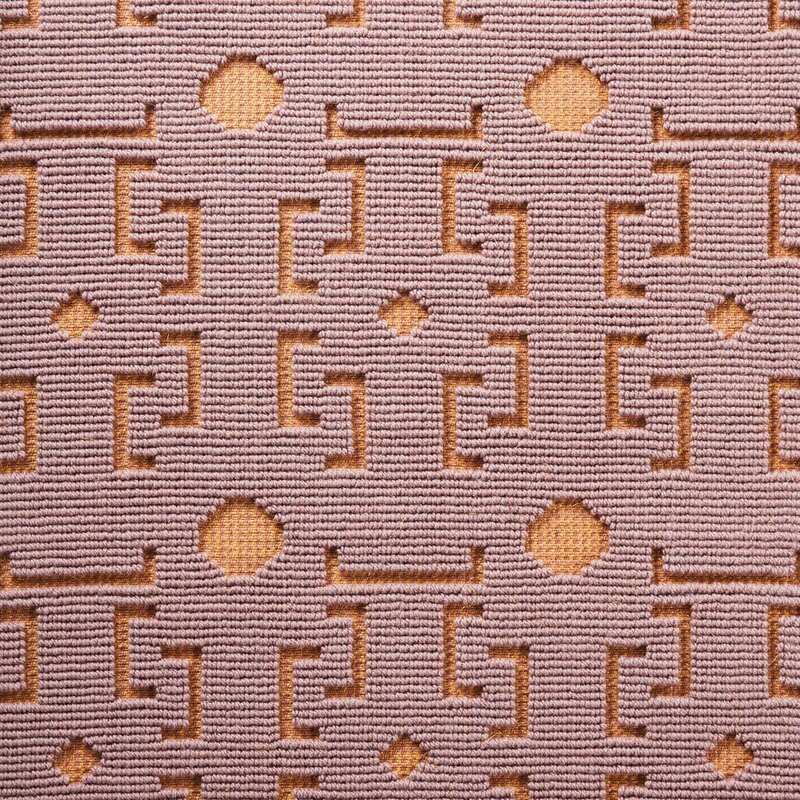 Parvata by Jean-Marie Massaud for cc-tapis // Parvata is the Nepali word for mountain, and Parisian designer Jean-Marie Massaud intends for the namesake rug to resemble “a segment of the Himalayas”. 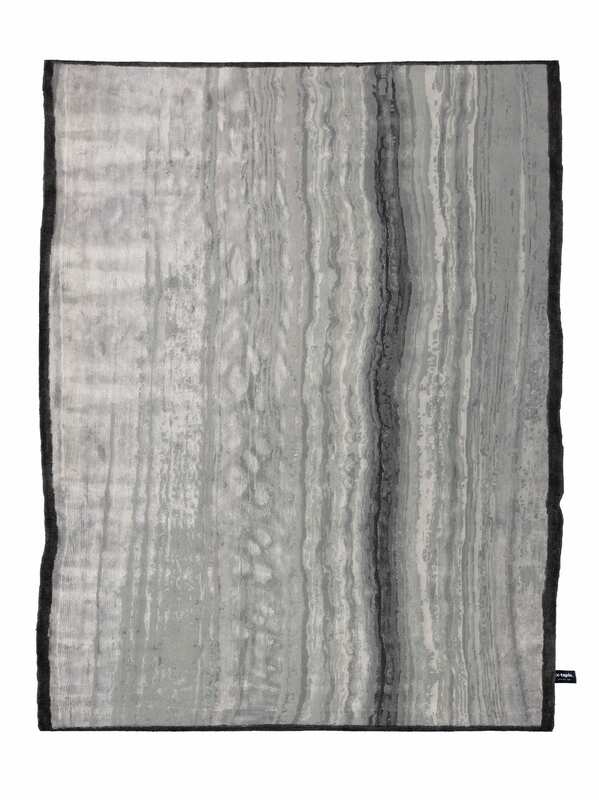 Handmade in the Kathmandu Valley at the base of the Himalayas, the compressed threads of cotton weave and silk mimic the pattern of natural rock formations. 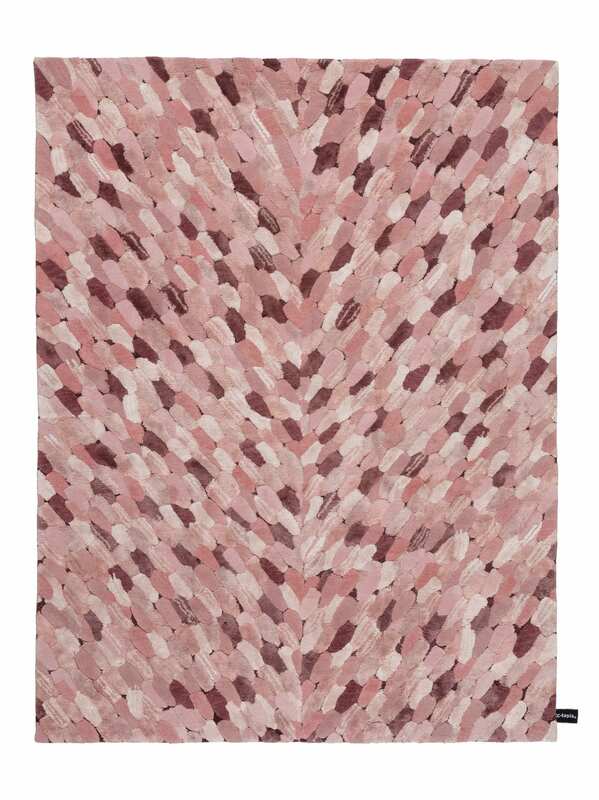 Envolée by Cristina Celestino for cc-tapis // Taking inspiration from the delicate wings of a butterfly, Cristina Celestino’s Envolée rug comprises alternating chromatic compositions defined by different material densities, from wool to linen. The combination creates a vibrant, hypnotic texture, pretty as a butterfly indeed. 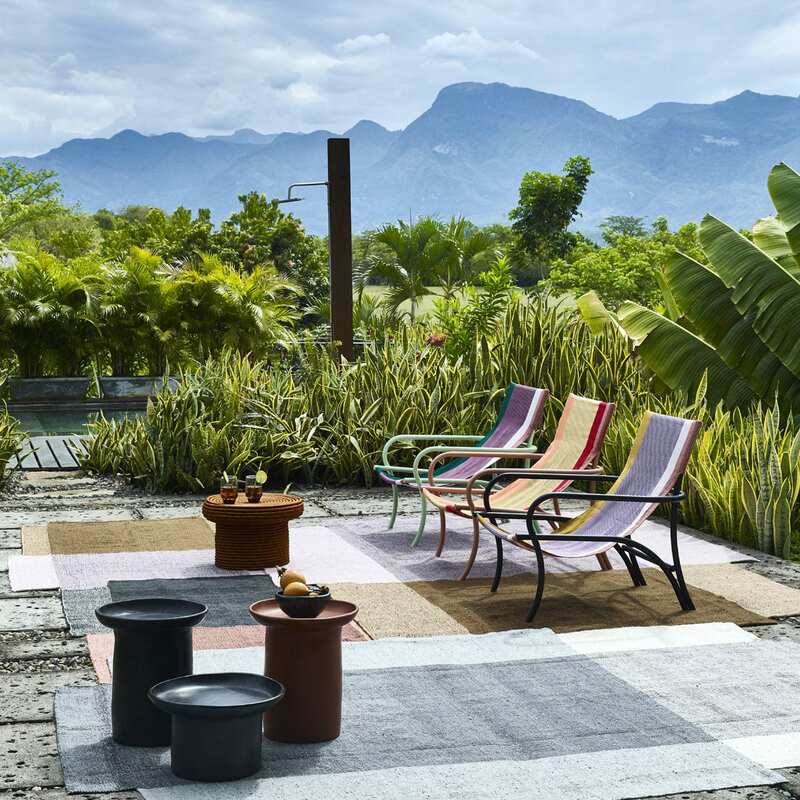 Personnalités collection by Elliott Barnes for La Manufacture Cogolin // Drawing on his original Conti design from 2017, American architect Elliott Barnes added four more rugs to his Personnalités collection. 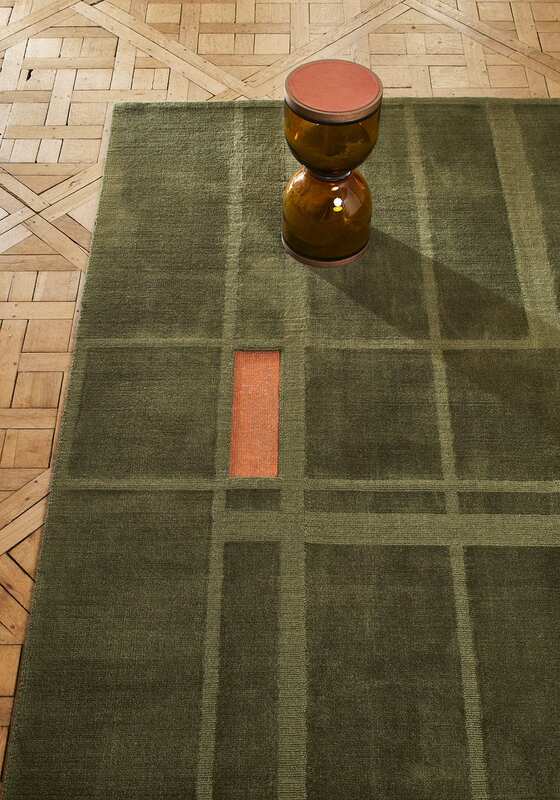 Inspired by Art Déco graphic motifs and the glamour of the 1920s, the rugs were hand-woven on narrow Jacquard looms and sewn together by hand. 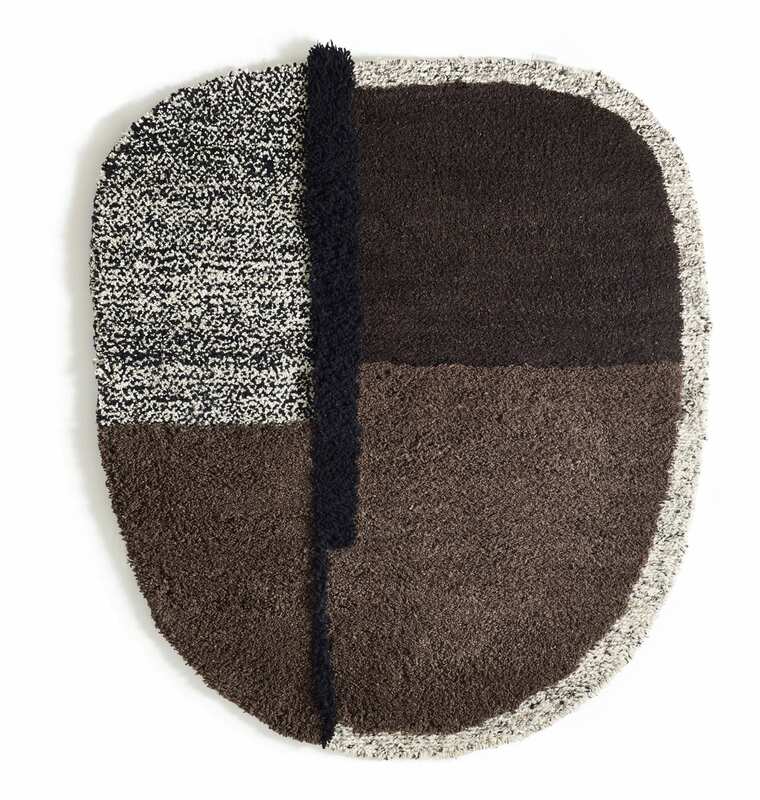 Nudo rug by Sebastian Herkner for Ames // Made in the Colombian city of Cajicá according to traditional local crafts, Sebastian Herkner’s Nudo mask-shaped rugs draw inspiration from colour-blocking designs of the 1970s. 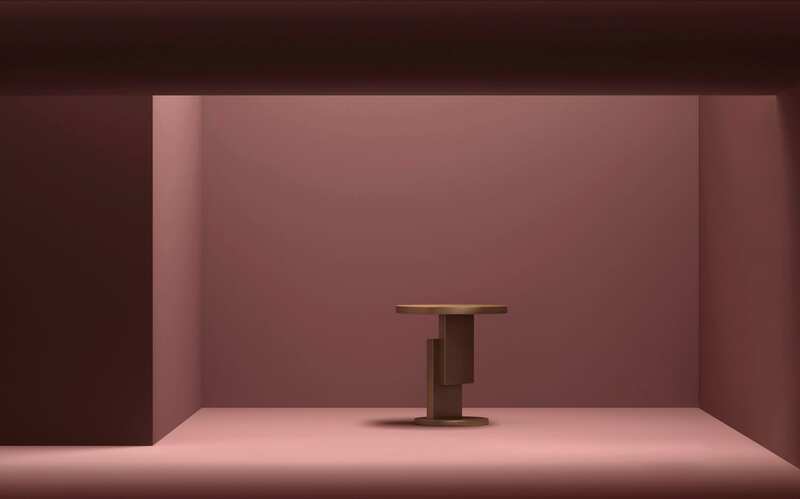 Barro collection by Sebastian Herkner for ames // The popular Barro dining collection is now available in red terracotta, referencing the appearance of traditional pottery from the Tolima region in Italy, where all ames ceramics are made. 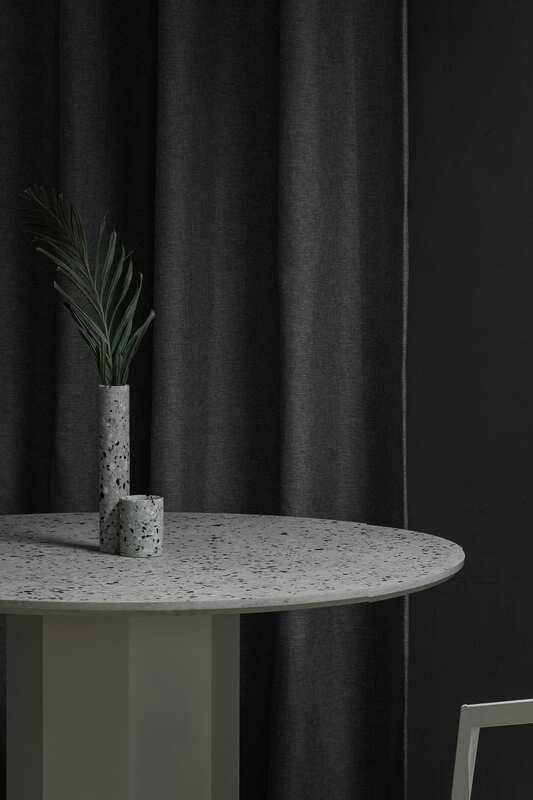 Distinct side table by Ferm Living // Made of durable acrylic stone, the Distinct side table plays on the ideas of Japanese minimalism by contrasting clean structure with rich textures and colours. 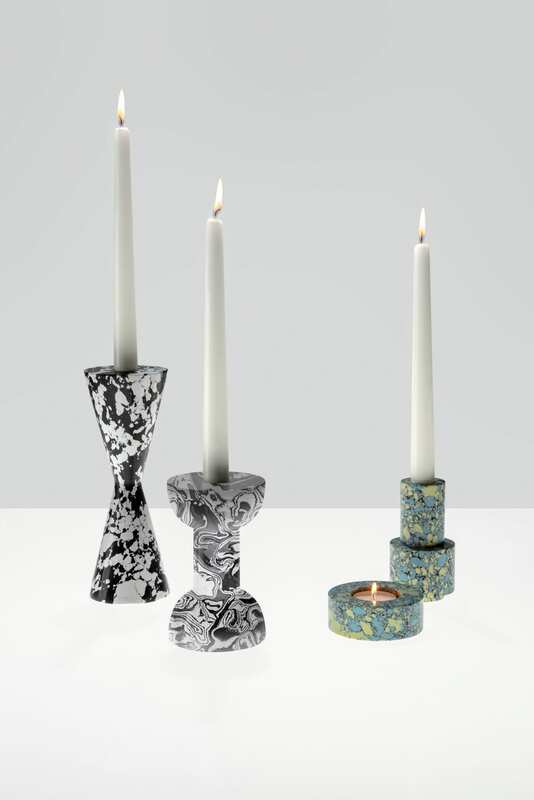 Swirl by Tom Dixon // This collection of bookends, vases, and candleholders are made from an innovative new material that combines pigment, resin, and recycled powdered residue from the marble industry. 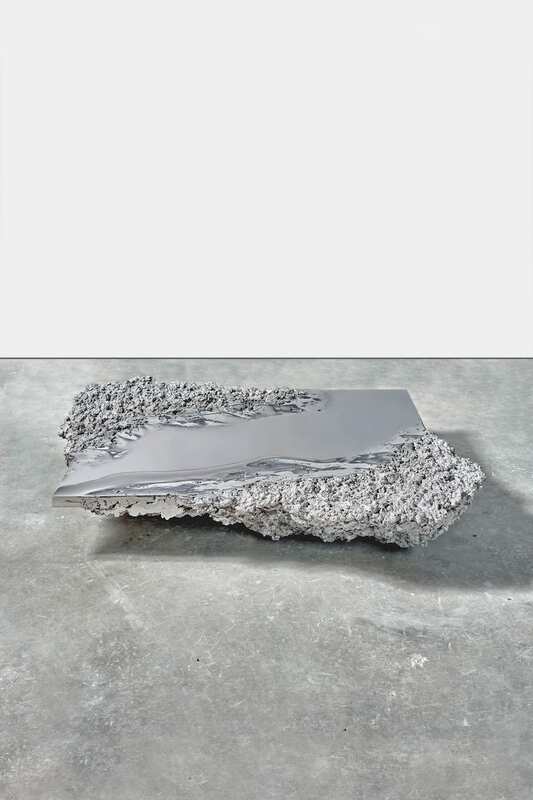 The result resembles 3D marbled paper, yet is dense and heavy like stone. Functional sculptures! 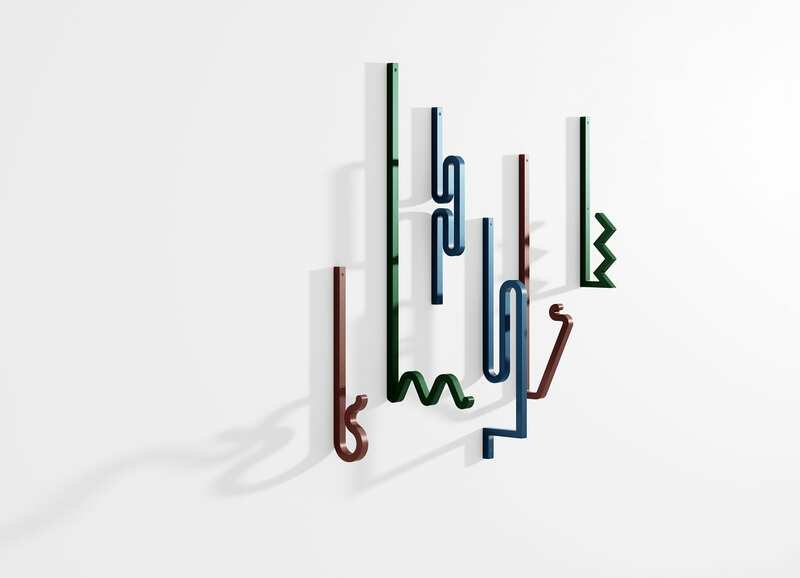 Zag hooks by Studio Bling for La Chance // The simple, strong shapes of the ‘sans serif’ font were combined by Studio Bling to create the Zag family of coat hooks. 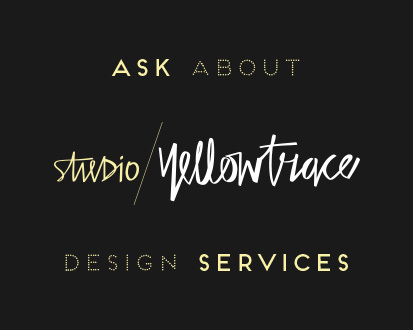 The various shapes and colours are meant to unite in graphic compositions, with each shape inspired by barrettes, pins, or twisted metal rods. 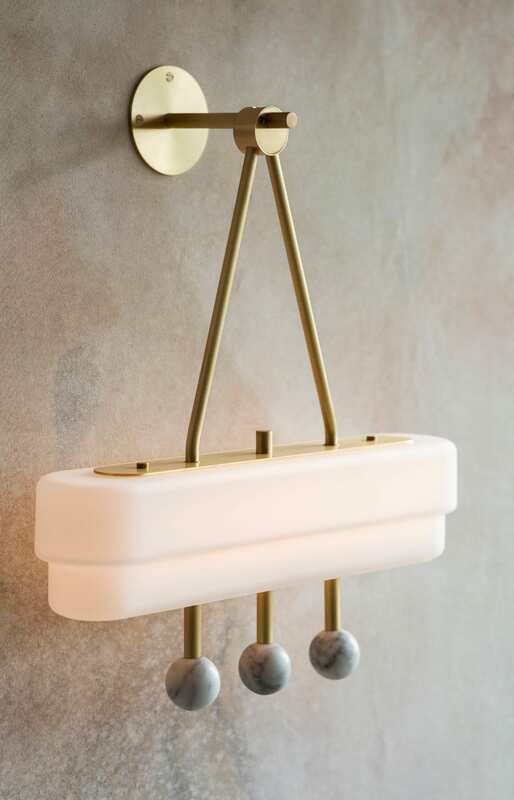 Each hook offers a different way to hang your clothes, bag, or accessory. 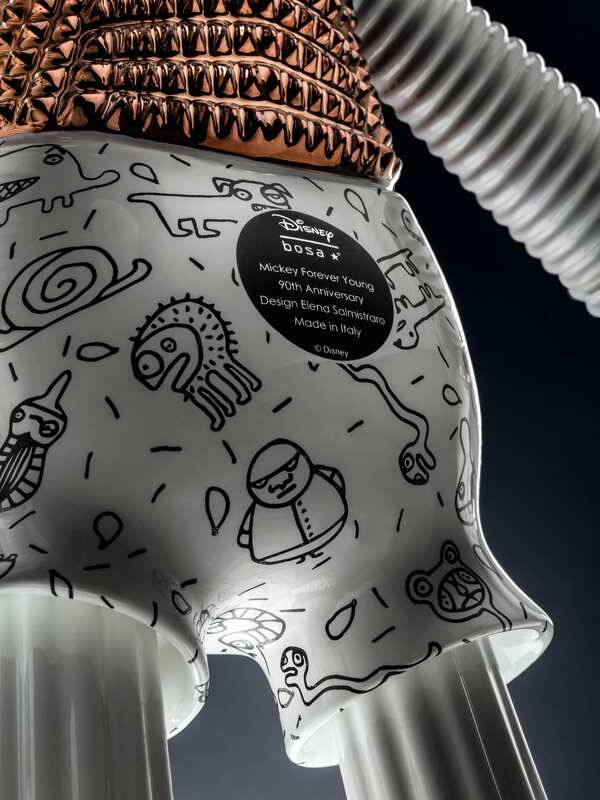 Disney X Bosa by Elena Salmistraro // In November last year, Disney celebrated the 90th anniversary of Mickey Mouse, which included a collaboration with renowned Italian ceramics house Bosa. 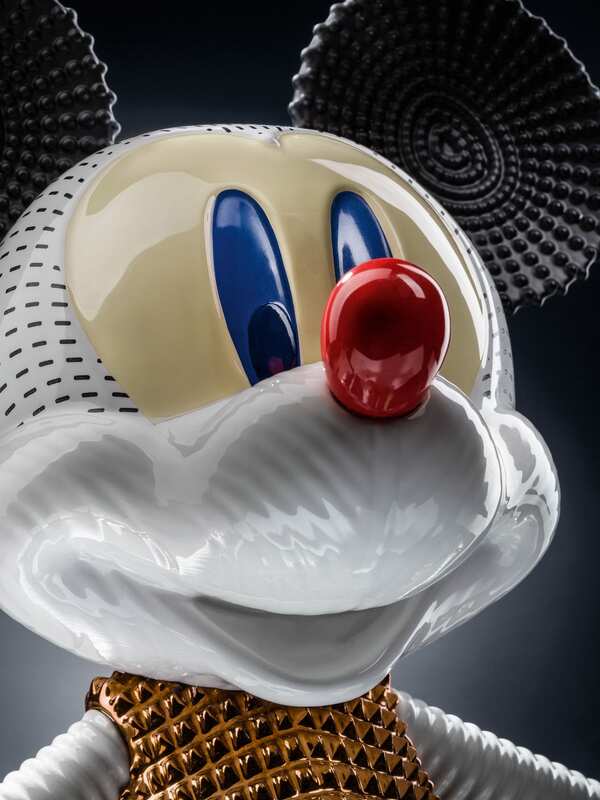 The celebration carried over to 2019, with Elena Salmistraro’s interpretation of the joy and vitality of Mickey Mouse on display at Maison & Objet. 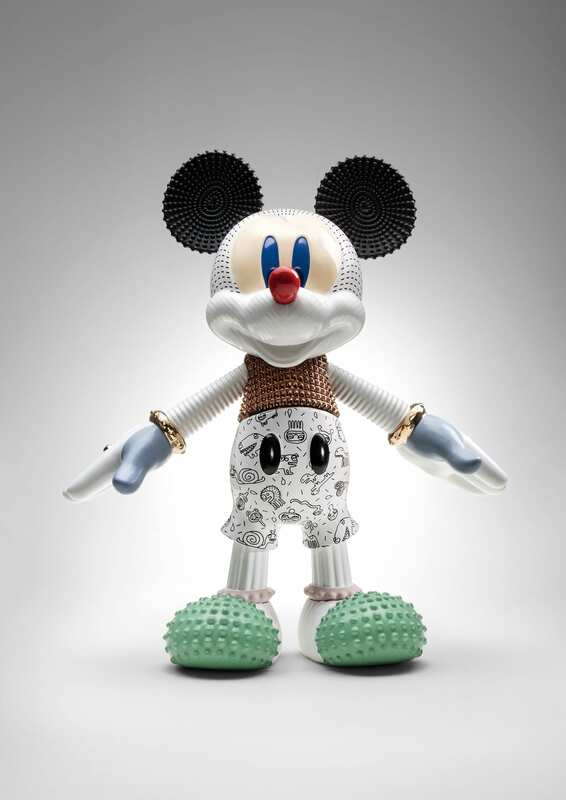 Her ‘forever young’ concept involved dressing Mickey in street-art shorts, a biker jacket, studded shoes and gold bracelets.